With her amber carapaces, lithe leonine tail, and impressive array of crowning antlers, there can be little doubt that she is her father's daughter through and through. Kasumi's body is bedecked with fire-orange carapaces over her spine, down the fronts of her forelegs, as well as scattered over her shoulders and flanks, topped off with a double set of horns that arch over and around her face like an exotic flower. Although her body is cloaked mostly in a deep stone grey, her mother's vibrant red and purple shades bleed through along her dorsum and on her head. The delicate facial structure, with high cheekbones and a slightly dished profile, could only come from Higurashi, and the same intelligent, piercing eyes are inlaid like citrine jewels framed by dark lashes. Anyone inspecting her closely would have difficulty placing her facial features as either local or foreign, a perfect blend of physical traits from both sides of her lineage. 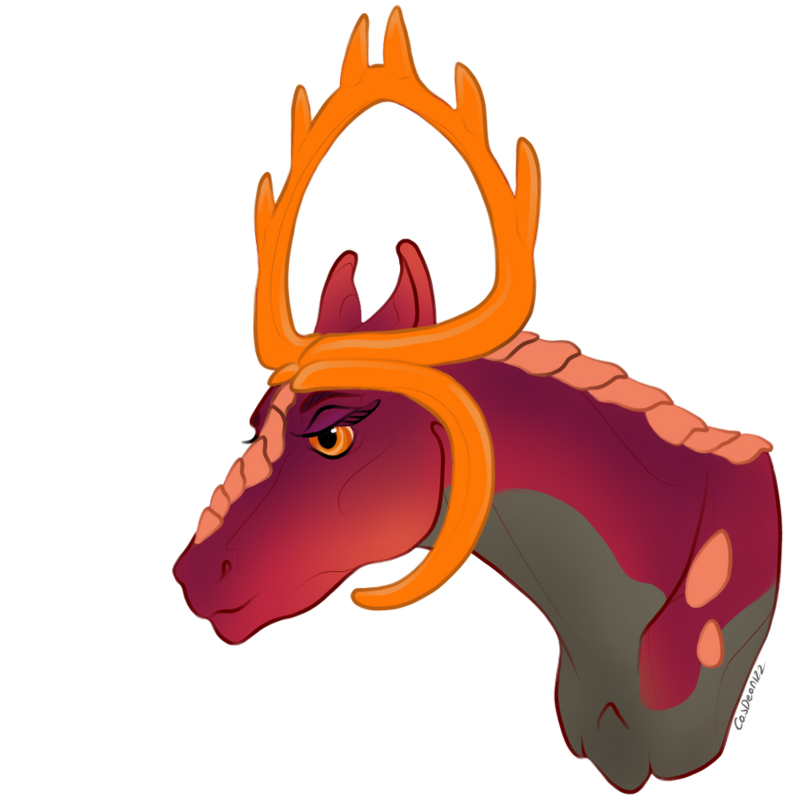 The fiery-hued carapaces proceed from her nose, between the ears, and down the back of her neck where her mane would have been, but what she lacks in locks of mane, she more than compensates for with her tail. A luscious wealth of violet tresses decorates the tip of her tail and trails behind her wherever she goes, kept neat and clean only through careful and consistent effort. Its volume nearly dwarfs her slim, willowy frame, which remains leggy and thin even into adulthood. Kasumi is also frequently seen with a sheer, gauzy veil obscuring all or part of her face - originally adopted to shield her eyes from riotous colors caused by her arcana, and later worn as merely a fashion statement. Kasumi is a quiet, serious child, always preferring to observe and internalize rather than contribute. Although she rarely volunteers her thoughts, it is clear when she does that her thought processes are highly mature and sophisticated for her age. She is a quick learner, a fast study of logic, plans, and strategy, and excels at complex ideas and analysis. When Kasumi commits to anything, she does so with an organized, disciplined work ethic. As the first daughter of the Lady Priestess Higurashi, it was deeply ingrained in her since birth that she was to inherit her mother's role as a spiritual leader. Curiously enough, her logical, reserved nature, apparently at odds with this birthright, has lent itself well to her training as a young priestess. Kasumi has wholeheartedly embraced learning her mother's religion, along with its accompanying language, prayers, dance, and traditions, and though she will never have Higurashi's charm and charisma, she is no less dedicated to her role. True to her maternal lineage, she has also inherited the unique empathic abilities that allow her to be uniquely in touch with feelings and emotions, a useful supplement to her extremely rational and logical insights. In Kasumi, others' emotions manifest as bright and often overwhelming colors visible only to her, which she combats by wearing a sheer-colored veil over her eyes as a child. As she matures into her ability, she will gradually learn to control and adapt to the visual stimuli, allowing her to forego the veil when desired. If Kasumi has many strengths of mind, her greatest weakness stems from the same root - self-sufficient and introverted to a fault, she finds social interaction exhausting and large crowds overwhelming for more than just the visual riot of color that their emotions cause. One-on-one interactions are comfortable, but anything more and she begins to lose her patience and energy, an unfortunate trait for a budding young priestess being trained to entertain and pray with large crowds. Whereas her mother has seemingly inexhaustible patience, serenity, and diplomacy, Kasumi has much less tolerance for anything and anyone that tests those limits. Daughter of Davaros, a Slidr River Valley local, and Higurashi Kagura, a priestess from a faraway land, Kasumi was born to a uniquely privileged position. Her mother, who was herself a product of a heavily matriarchal society, immediately claimed her precious firstborn daughter to be groomed as inheritor of both her religion and her long, storied lineage of priestesses. Kasumi also became the heir to Higurashi's position of Jarl in Grosugr, and in addition to her adoring mother and father, many throughout Vromme became like her adopted family. By many metrics, she was a spoiled and privileged child, but her serious, reserved nature was never greatly changed by this. As she grew older and came into her own as a priestess, Kasumi would be bestowed her geimei, or stage name, by her mother: Tamagiku, meaning 'jeweled chrysanthemum' in her native language, after the amber horns that bloomed above her head like a crystallized flower. Enhanced natural empathy and slight adjustments to a prior-existing emotion. E.g., a gentle bolstering or dampening of sadness where the object is already sad. Cannot introduce a new emotion that was not previously naturally incurred. Limit 1 individual at a time. Can now additionally introduce a foreign emotion not previously felt, though it cannot be manipulated to the extent and strength of a native feeling. E.g., making someone who was previously calm experience an inexplicable feeling of anger. Previously-existing emotions, however, can be heightened or muted at will. Limit 2 individuals at a time. Introduced and native emotions can be manipulated to the same extent. With concentration, a single emotion of 1 individual can be heightened to an overwhelming degree (e.g., inducing crippling guilt in a remorseless individual). To a lesser extent, emotions of up to 5 individuals can be manipulated at will. Emotions of dozens of individuals can be artificially heightened or restricted at a time. The higher the number of objects, or the greater the change in emotion, the more concentration and energy required. In the extreme, any feeling can be numbed to nearly nothing or made all-consuming and overwhelming.